Prostate cancer is the second most common cancer among men worldwide. Around 20,000 men are diagnosed each year with prostate cancer in Australia. Below we highlight key prostate cancer statistics for Australia and compare them with selected countries. 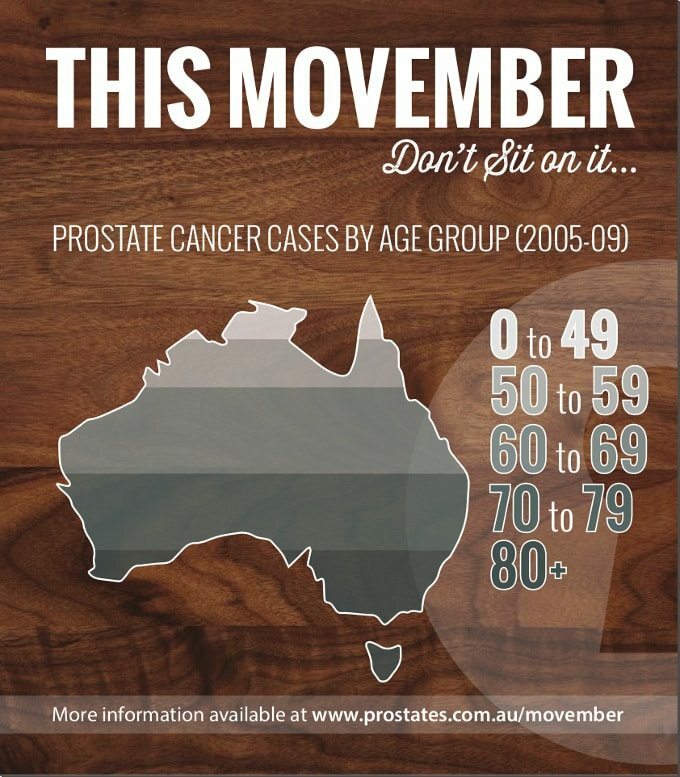 98% of of men diagnosed with prostate cancer in Australia are 50 years of age or older. Number of diagnosed cases of prostate cancer in Australia broken down by year and age group. PSA testing has made prostate cancer detectable at an earlier age. Since 1990 the number of men in their fifties diagnosed with prostate cancer has increased 11-fold. Every year during November the Movember campaign aims to raise awareness on prostate cancer. Australia has one of the highest incidence rates of prostate cancer in the world, largely due to the popularity of PSA testing. The table below presents age-standardised incidence and mortality rates per 100,000 in countries with the largest number of cases. Ferlay J, Shin HR, Bray F, Forman D, Mathers C and Parkin DM. GLOBOCAN 2008 v2.0, Cancer Incidence and Mortality Worldwide: IARC CancerBase No. 10 [Internet].